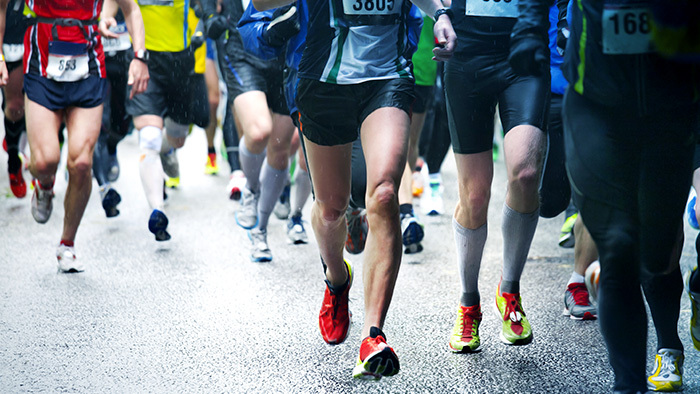 When planning your running season, you may center your training on a big race or your race season as a whole. However, you wouldn’t plan your marathon training around one singular workout as the golden workout that will rocket your performance. When it comes to setting your goals for the next year, how can you best forecast your fitness? More specifically, how do you draw a path to your best marathon finish? If you’re a frequent user of TrainingPeaks you know that if your blue CTL (Chronic Training Load) line is trending upward, you’re increasing your fitness and building up to a better potential race. A higher CTL doesn’t guarantee a better performance, it only means you have the potential to produce a good result. 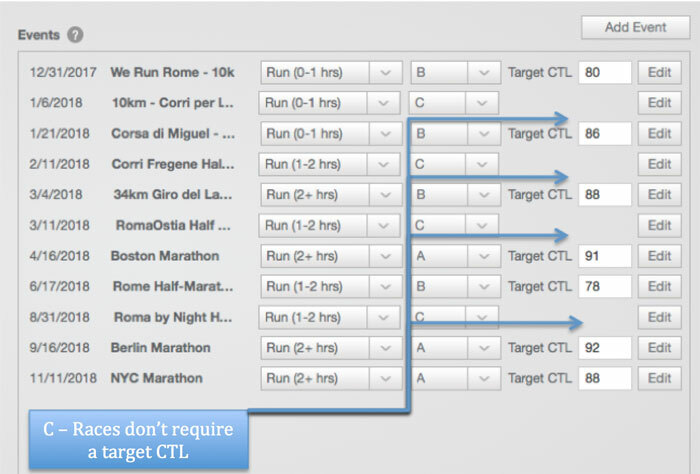 Planning to a target CTL with the ATP tool will help set you up for your PR, leaving it up to you to execute from start line to finish line. As we stare down the start line of a new year, how can you set yourself up for marathon success? If you’ve read this far, you ‘re probably familiar with the big three markers in TrainingPeaks: TSB, CTL, and ATL. All of these are based on the accumulation of TSS and how the accumulation of training stress effects your current and future performance. 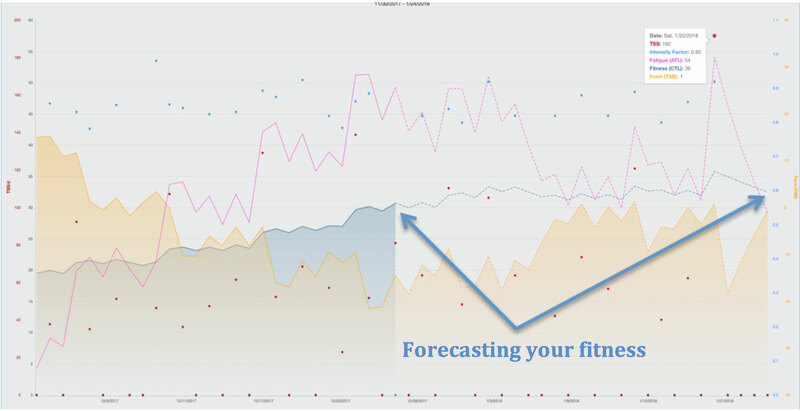 As you become more comfortable with what you’re viewing in the Performance Management Chart (PMC), you can start to forecast your fitness and see how a large training block, training camp, or individual workouts will play into your overall fitness. Knowing how all these training markers interact will allow you (or your coach) to build out your day-to-day workouts. After that, it’s up to you to meet your TSS goals! To perform at your best year-to-year, you need to be consistent, remain injury free, and also know that your training is heading in the right direction. 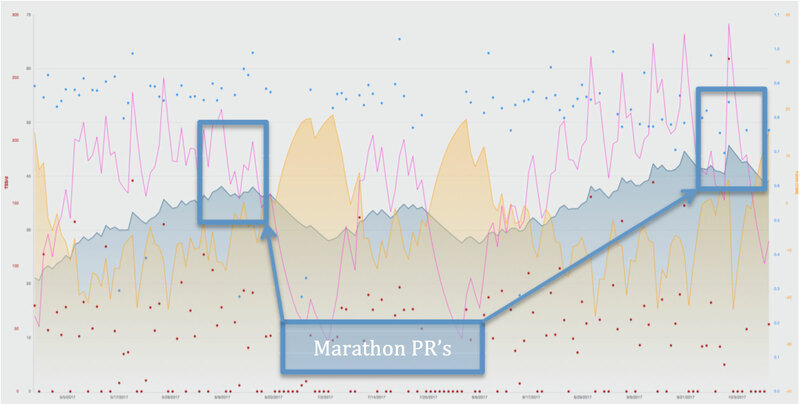 Luckily TrainingPeaks has the ATP tool, which will help you set yourself up for marathon success. 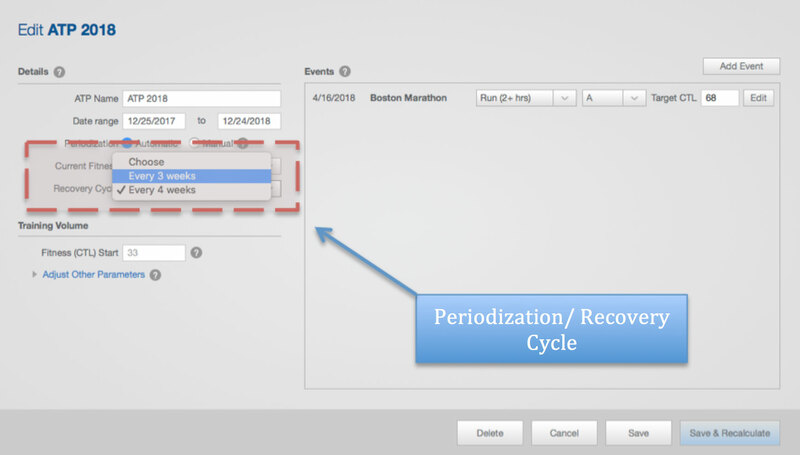 If you’ve been keeping data in TrainingPeaks for more than a year, and have been managing your zones correctly, you can build out a great plan based on a target CTL. What was your CTL when you last performed at your best? What is your current CTL? What was your ramp rate leading into the last six-to-eight weeks of your peak event? Did you suffer from any injuries during that time? Can you relate any injuries directly to an increase in your training? Setting a goal CTL isn’t new for most triathletes and cyclists. It’s been used for nearly a decade to help set up athletes to perform at their best leading into grand tours, stage races, and IRONMAN World Championships. However it’s now coming to the surface as a great planning metric for runners as well. The recommendations ahead are based on novice to advanced marathoners who are running 40+ miles per week, and are completing at least two focused workouts per week. As with any workout program, consistency is key. Anytime you skip or miss a workout, the zero that goes in for that day’s TSS is a big hit to your CTL. That zero doesn’t just go away—that zero is carried for 42 days! However, the other side of the coin is that trying to “make up” for that workout can put you further behind if you end up injured. If you haven’t yet educated yourself on CTL Ramp Rates, take a chance to educate yourself before moving ahead. The goal of any athlete is to improve race-to-race, and season-to-season. As a marathoner, you understand that you build up your long runs over time, but how do you know if you’re running enough mileage or doing “enough” to see a benefit? Monitoring and tracking your CTL will show you how your training is trending. If you want to improve in your next marathon, setting a goal to improve you CTL by 10 percent for a race in four to six months is achievable. Taking the time to plan in hard training blocks balanced with downtime is essential to success. Consistent training has far more benefits than extreme periods of hard training mixed with similarly long periods of no training. Doing a little everyday pays a bigger return in the end. As an example, an athlete with a past best CTL of 68 looking to improve by 10 percent (.1×68= 6.8 ~7 points) would shoot for a CTL of 75 for their next target marathon. If you assume that this same athlete is comfortably maintaining a CTL of 45 week to week in the off-season, they will need to build 30 points of CTL in the four months building up to their race. Planning this build up is best seen in the eyes of the ATP. Using the ATP tool is key to making sure you don’t have any weeks that are too aggressive. Use information from your last best performance to guide your next training cycle. Did you hit a ramp rate of 6 in your last build up on a regular basis? Was that a particularly hard time to recover? If 6 put you in a tough spot, and you see a number of ramp rates over 6 in your build up—your goal may be too aggressive. Adjust your CTL goal until you start find your sweet spot. Most athletes can handle a ramp rate of 4 to 6 points per week without too much discomfort. As we age our ability to efficiently recover decreases and a good coach (even if that’s you!) should factor that into your plan. Athletes with a good fitness history under the ages of 40 can manage building for three weeks before a suggested recovery week. Athletes over 40 years of age might consider building for two weeks before a suggested recovery week. The three-week recovery cycle is especially important if the athletes CTL goals are over 55 points. It’s also important that frequency and duration of races on your schedule be considered. If you plan to train through a race, you should still take a few days of downtime after your race to allow your body to absorb the work you’ve done through racing. Using races as checkpoints is a great way to test your fitness and find out if you’re on the right track. Using a race for this purpose can be beneficial toward your CTL goals if you factor in the TSS to your weekly TSS goals. If you plan on a full taper for a race in your build up; you should classify the race as an “A” race or “B” Race. You need to factor the taper and prep into your ATP, as the drop in training during these periods will effect your progress. It’s also important to not set every race with a higher CTL than the race preceding it, especially if races are far apart or even very close together. TrainingPeaks can factor in a great number of details from swimming, biking, running and strength workouts. However, it can’t factor in life stressors, those like divorce, loss of a family member, work stress, or other major changes. Your body sees stress in one direction and if you’ve got stress in your life it can impact your longterm goal. Be conscious of these factors if they exist and listen to your body. Patience is key! The “L” factor is life; which is something you and your coach need to be on the same page about. How can you adjust the plan if you know you’ll have work travel in the future? How will you plan for unexpected illness? To ensure that you maintain the right trajectory for your goals, you or your coach can go into the ATP at anytime and adjust your weekly rates. By shifting the bars around you can determine what needs to take place in the weeks prior [if you’re planning ahead] or weeks following your downtime [ in the case of illness] to help keep you on track. Keep a close eye on ramp rates and adjust any outlying high weeks to make sure you spread out the TSS over a few weeks. When it comes to planning, there is no right or wrong way. 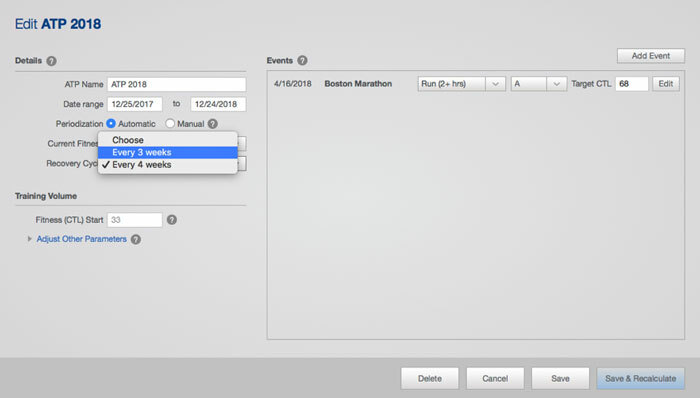 Planning for your next marathon with a goal CTL is best for athletes who have a good feel for their data points, and know what kind of training load they can handle. Setting big CTL goals with the ATP tool will also help ensure that you’re not setting yourself up for an injury-prone build up. The ATP tool will also help you balance recovery and training, giving you the best opportunity for success! If you’re looking to make the next year your best, consider using the TrainingPeaks Coach Match Program for 1:1 coaching; or a coaching consultation to review your ATP.